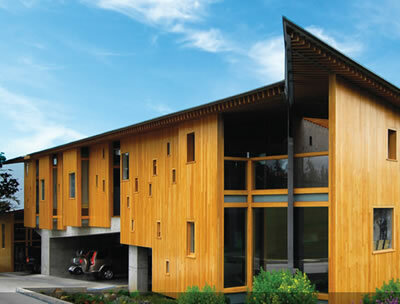 Wood is increasingly becoming the building material of choice for residential and commercial projects the world over. Wood can be locally sourced and often costs less to install. And, wood is increasingly being selected by homeowners and architects who appreciate that wood is a naturally green material – capturing and storing carbon – with strength and flexibility profiles that allow for exciting interior and exterior design. Using Sansin factory finishes, builders can control costs and improve quality leading to consistent results for commercial and residential structures that are both protected and beautiful. Contact us today at precisioncoat@sansin.com to find machine applicators in your area or Sansin Precision Coat Dealers.